When completed, the new Patrick J. Paladino Memorial Boathouse will serve both youth and adults from across Western New York. Thanks to the support of a $1 million grant from the Ralph C. Wilson, Jr. Foundation, the Buffalo Scholastic Rowing Association (BSRA) has experienced rapid growth over the past year. In addition to new and expanded programs, work on the organization’s new boathouse and rowing center at 405 Ohio St. in the city’s Old First Ward neighborhood is well under way! 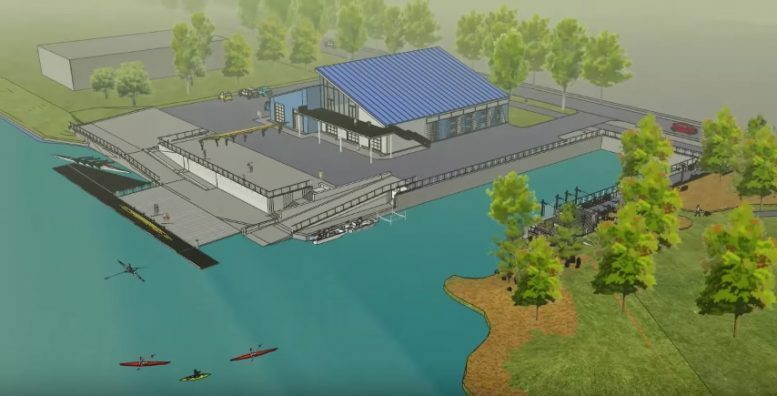 When completed, the new Patrick J. Paladino Memorial Boathouse will serve both youth and adults from across Western New York, as well as members of the community seeking to learn or develop in rowing or water sports and those who simply want to enjoy an easy access point to the Buffalo River. The new facility will also provide classroom, office and fitness/training space; locker rooms and boat storage; and more opportunities for challenged athletes to participate in adaptive rowing programs. The history of the BSRA dates back to 2010 when several lifelong rowers and rowing coaches from the local community formed the nonprofit organization to provide increased resources and greater access to the sport of rowing for the entire community. Its birth marked the first new rowing organization and facility in Buffalo in over 100 years. According to BSRA Executive Director Hilary Epes-Oballim, BSRA now offers youth, community, corporate, learn-to-row, scholastic, and summer competitive programs and camps. BSRA membership opportunities are also available for just $75 per person, plus a $25 facility fee. Membership includes a BSRA newsletter subscription and updates on events, access to equipment during boathouse hours and the opportunity to book private events, ability to enroll in BSRA rowing programs and an opportunity to be selected for nomination to the organization’s board of directors. “Our mission is to R.O.W. — recreation … outdoors … water,” said Epes-Oballim. On Sunday, March 10, the BSRA will host one of its largest and most popular offerings, the Shamrock Row, from 9 a.m. to 2 p.m. in the Old First Ward Community Center, 62 Republic St., Buffalo. Competition categories will include Juniors, High School/Scholastic, Open and Masters. For more information on the BSRA, membership, upcoming programs or the Shamrock Row, please call 800-5460, visit https://rowbuffalo.com or email info@rowbuffalo.com. You can also follow the organization on Facebook at www.facebook.com/RowBuffalo for frequent updates. Be the first to comment on "Buffalo Scholastic Rowing Association continues rapid growth on the banks of the Buffalo River"